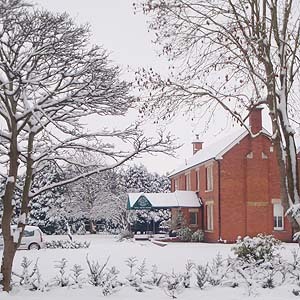 Stay with us for 2 or more nights (including a Friday or Saturday night) from October to February, or for any 2 or more nights over Christmas and the New Year (23rd December to 3rd January period) at the special rate of 70 pounds, per room, per night ... including our continental breakfast, 50 channel TV, internet access, unlimited soft drinks / teas / coffees. All of our rooms are double or twin bedded, and let for single or double adult occupancy; we're an ideal base if you're visiting friends or relatives in Melksham, or taking a weekend away and seeing Bath, Lacock, Caen Hill or many of the other attractions and historic places around. 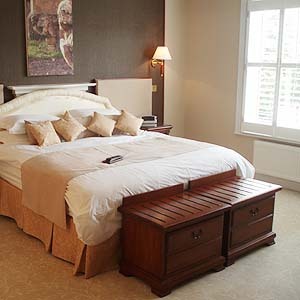 Regular rates [updated for 2011] - £95.00 per room (double occupancy), £85.00 per room (single occupancy), per night, including our continental breakfast: Freshly squeezed orange and grapefruit juice. Cereals, yoghurts, actimel, fresh fruit. Brown and white bread and toast, croissants, rolls and mini-danish. Hams, other meats and cheeses. Butter, marmalade, marmite, honey and jams. Teas and freshly ground coffees (Americano, Espresso, Cappuccino, etc). We are five minutes walk from Melksham Town Centre. We have plenty of parking, or if you prefer to use public transport the bus stops right outside (services 272, 273 and X72 to / from Bath and Devizes). Keycards give you access to the hotel and your room at any time through your stay. Checkin from 3 p.m. to 10 p.m, but if you let up know ahead of time you arrive earlier or later. Evening meals may be ordered for delivery from local 'takeaways' - Indian, Chinese, Kebabs, Pizza and Fried Chicken can all be delivered, and there's a wide variety of other takeaways in the town too. You're welcome to eat your food in our restaurant or in your room ... and we provide bottle openers, corkscrew, glasses. We are not licensed, but you're welcome to bring in your own alcohol ... from the off license that's just two doors up the road from us, or from elsewhere. If you have found this through our technical blog ... YES - hotel guests do have access to our library of 700 open source books, and you're welcome to ask the staff your Internet programming questions - they'll know the answer, or know who to ask! Which version of MySQL am I running?